No one wants to be uncomfortable, stressed or go through any type of suffering. This thing that we call flesh doesn't want to suffer anything. 1Peter4: 1 So then, since Christ suffered physical pain, you must arm yourselves with the same attitude he had, and be ready to suffer, too. Job1: 6 One day the members of the heavenly court[a] came to present themselves before the Lord, and the Accuser, Satan,[b] came with them. 7 "Where have you come from?" the Lord asked Satan. Satan answered the Lord, "I have been patrolling the earth, watching everything that's going on." 8 Then the Lord asked Satan, "Have you noticed my servant Job? 9 Satan replied to the Lord, "Yes, but Job has good reason to fear God. 10 You have always put a wall of protection around him and his home and his property. You have made him prosper in everything he does.11 But reach out and take away everything he has, and he will surely curse you to your face!" 12 "All right, you may test him," the Lord said to Satan. The enemy is roaming the earth seeking whom he may devour. The enemy's assignment is to destroy what God honors. 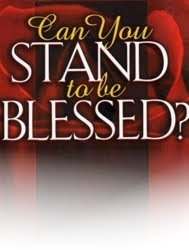 Who can STAND to be BLESSED? We all want to be BLESSED. We even sing the favorite well known song during offering: "We're Blessed in the city, we're blessed in the field, we're blessed when we come and when we go-o-o..."
We want blessings from the Lord, but don't want to be TESTED. Job lost all he had. His Position. His Family. His Health. 1 peter 4: 12 Dear friends, don't be surprised at the fiery trials you are going through, as if something strange were happening to you. 13 Instead, be very glad—for these trials make you partners with Christ in his suffering, so that you will have the wonderful joy of seeing his glory when it is revealed to all the world. 2 Tim 2:12 If we endure hardship, we will reign with him. 1 Peter 3:14 But even if you suffer for doing what is right, God will reward you for it. So don't worry or be afraid of their threats. 15 Instead, you must worship Christ as Lord of your life.19 So if you are suffering in a manner that pleases God, keep on doing what is right, and trust your lives to the God who created you, for he will never fail you. The enemy is the author of CONFUSION but, I'M SO GLAD GOD HAS THE FINAL SAY. Romans 8:18 Yet what we suffer now is nothing compared to the glory he will reveal to us later. If we were to lead our lives on what we have felt...what we are feeling...what we have seen...what we are seeing with our natural eyes...we would be---LOST!!! We must not trust in what we see, but what we don't see. We must walk by faith and not by sight. Allow the situation or situation(s) you're facing build your faith. Happiness is based on happenings. Happiness must be an internal thing not external. Don't base your happiness on people, because Man will fail us every time. We can only be accountable for our actions. Put on the whole armour of God, that ye may be able to STAND against the wiles of the enemy. God is faithful. We must PUSH..."P" pray and praise "U" ntil " S" omething "H" appens. STAND until your Blessing is Fully Come. So you know, Throwing in the towel is no longer an option!!! Last night the enemy was trying to distract me with the circumstances and issues that my husband and I are facing. It's like this "Challenge" just brings out the worst of things my way. I thank God for the power of the Holyghost! When we continue to listen to all the lies that the enemy tries to speak to penetrate our hearts and mind with doubt and fear, we allow the enemy to have the victory. We must tell the enemy to SHUT-UP and where to GO! The only thing the enemy can do is lie, do not entertain another one of his lies. There is power in the name of Jesus. Plead the blood of Jesus and rebuke every demonic spirit out of your house. STEAL-to take (the property of another or others) without permission or right, esp. secretly or by force. KILL-to deprive of life in any manner; cause the death of; slay. DESTROY-to reduce (an object) to useless fragments, a useless form, or remains, as by rending, burning, or dissolving; injure beyond repair or renewal; demolish; ruin; annihilate. The enemy comes to steal, kill and destroy MARRIAGES. We must be aware and understand that the enemy's assignment is to steal, kill and destroy. The enemy's position of responsibility is to steal, kill and destroy. The enemy's post of duty is to steal, kill and destroy. The enemy's like is to steal, kill and destroy. The enemy's task is to steal, kill and destroy. The enemy's interest is to steal, kill and destroy. The enemy's obligation is to steal, kill and destroy. We must cover our spouses. Cover for protection, Cover for concealment, Cover for warmth, Cover to shelter, Cover to protect, Cover to serve as a defense for. In the Bible, I Corinthians 7:14 For the unbelieving husband has been sanctified through his wife, and the unbelieving wife has been sanctified through her believing husband. Change the way you look at the circumstances and the issues you are facing in your marriage as opportunities for God to work in your life. God created us for His purpose to be fulfilled. God knowing ALL...If you got it, you have been equipped to handle it. 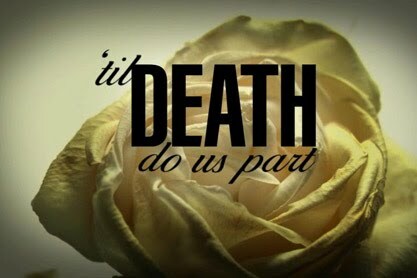 Remembering the vows we vowed to our spouse and to God-- For better or For worse. The "for worse" seasons are going to come and they can be very uncomfortable. It's Day 10 of the Challenge. Thus saith the Lord of host, consider ye, and call for the mourning women, that they may come; and send for cunning(skillful) women, that they may come; And let them make haste, and take up a wailing for us, that our eyes may run down with tears, and our eyelids gush out with waters. There will be times when our husband will not only need us to just pray for him, but to travail on his behalf. (There will also be times when we will need them to travail for us.) Men face so many different issues, that they need us praying for them without ceasing. Some issues require for us to travail on their behalf; for breakthrough, to destroy yokes, to pull down strongholds. We can contribute to our husband’s happiness by travailing in prayer for them. Travail about issues that are most dear to their hearts. Travailing can mean to bare, bring forth, or distress. Travailing can even mean to act as a midwife to one. What does a midwife do? A midwife helps bring new life. Travailing and pouring out your heart on behalf of your husband (or anyone) brings about great change. Through travailing prayer we can powerfully intercede for our husbands and such intercession involves spiritual warfare and the birthing of miracles. How awesome is that; that God entrusts us with the responsibility of birthing miracles! Whether your husband has been saved for years, just a few days, or is not saved at all, both of you will benefit greatly from your travailing prayers. Jesus spent so much time travailing in prayer, weeping before His heavenly father. Let’s follow His example. Another saint that comes to mind that travailed in the bible is Hannah. Hannah was barren and travailed in prayer to have a child. It did not come to her easily. Hannah travailed before the Lord so hard, that Eli thought she was drunk. She weeped, cried, moaned, and groaned so much so, she was mistaken for a drunk! Wow! Travailing prayers work great victories; not only did the Lord give her a child, but she became the mother of 3 sons and 2 daughters. I just want to share my testimony about the power of prayer, self evaluation, and most of all Love. I have never participated in a community prayer, so when Stephanie invited me to call into the Morning Prayer on Thursday’s I was very hesitant. My marriage like several other marriages is not perfect. We have disagreements which leads to arguments that then leads to words being said that will eventually bruise that individual. This is how my marriage was going. Dr. Emerson Eggerich gave an awesome name for the actions that continued to occur in my marriage. Dr. Eggerich with Love and Respect called those events the “Crazy Cycle”. Even though I took responsibility for the things I may have done, did not do, say, or did not say, I continued to express to my husband what he was lacking to do, or say. He would always tell me “how can see my faults but can’t see yours”. I would just ignore him because I felt as though I entered our marriage under “false pretense”. I also felt as though he breached the contract for which we had both agreed too. Finally, my brethren, be strong in the Lord, and in the power of his might. 11Put on the whole armour of God, that ye may be able to stand against the wiles of the devil. 12For we wrestle not against flesh and blood, but against principalities, against powers, against the rulers of the darkness of this world, against spiritual wickedness in high places. Love is patient, love is kind. It does not envy, it does not boast, it is not proud. 5It is not rude, it is not self-seeking, it is not easily angered, it keeps no record of wrongs. 6Love does not delight in evil but rejoices with the truth. 7It always protects, always trusts, always hopes, always perseveres. Women, look around when you go to church. We are lacking our men. The Enemy is attacking our men physically, spiritually, and mentally. The Enemy does not want marriages to work. If you are wonder why…it is simple…Marriage is ordained by God. Marriage is a covenant made between one man and one woman and the piece that holds it together is GOD. The enemy knows is cannot eliminate God so he goes for the next best thing…God’s creation…either the Man or Woman. Women…we have to fight for our marriages as if our life depends on it. We can’t just give up because we believe our husband “breach the contract”. We have to let the Enemy know We know who he is and fight him just like Jesus did…with the Word. Women lets be like the virtuous women in Proverbs 31 “…she openeth her mouth with wisdom and her tongue is the law of kindness…” Let us lift our men up to Christ. Let us all conduct a self evaluation and commit to changing our ways. Let us commit to loving our husband as whole heartedly for we know no matter what obstacles that come if we love and show love no matter what we will win “…and now these three remain: faith, hope, and love. But the greatest of these is love” II Corinthians 13:13. I am sharing this with you all because through my self evaluation I realize that I was not praying a sincere prayer to God I was only complaining. I realized that I loved my husband but I was only showing him love when he showed me love. Finally, I was not respecting him as the head of my household. We are instructed to respect our husbands in Ephesians 5:32. To all my the women living for Christ…have you conducted a self evaluation of yourself? Are you praying a sincere prayer or are you complaining to God? Do you love your husband the way His Word instructs us to or are you showing him love according to what he does for you? Are you showing your husband you love him? Are you respecting your husband as the Head of the Household? Ladies, how are we loving our husbands? Do we really know what it means to love our husbands? Marriage can be the most intense environment for practicing love. I have learned that I can’t do this thing on my own, I have to love with God’s love. That’s where I was falling short in my marriage. I was trying to love my husband with my own love (which really wasn’t love) and I failed EVERY TIME. Loving with God’s love allowed me to love my husband even when he had mistreated me. My life and marriage work better when I love with God’s love, which is the only way we can love right! I don’t always get it right, but I’m still learning what it means to love with Christ’s love. Talking to God about your husband is an act of love. Stormie Omartian (author of The Power of a Praying Wife) says - Prayer is the Ultimate love language. It communicates in ways we can’t. Something happens to our hearts when we pray for another person. The hardness melts. We become able to get beyond the hurts, and forgive. We even end up loving the person we are praying for. It’s miraculous! It happens because when we pray we enter into the presence of God and He fills us with His Spirit of love. When you pray for your husband, the love of God will grow in your heart for him. Not only that, you’ll find love growing in his heart for you, without him even knowing you are praying. It is often easier to pray about our mates than it is to pray for them. “Lord, I don’t like what he is doing…” That is praying about our husband. But the Scripture says that even if someone has despitefully used you, you are to pray for that person. Praying for our husbands has nothing to do with our rights, how we are treated, or what the he may be doing. It is our responsibility, no matter what the circumstances. When we pray for our husbands, we have the privilege of seeing God work in his life as a result of our prayers. The greatest gift we can give to our precious husbands is to pray for them. Let’s love our husbands with the same kind of commitment that you already have to loving yourself. Jesus set the example for sacrificial love, let’s follow His example. How could your sacrificial love smooth over any areas of your marriage? Challenge love your husband with God’s love. The only true love there is.